Hasina Begum's earliest memory is of watching the jungle cut down to expand the camp in Bangladesh that is the only home the 31-year-old Rohingya refugee has ever known. Begum is one of about 300,000 Rohingya who escaped turmoil in Myanmar before the latest eruption of violence brought another half a million refugees to Bangladesh, pushing already overcrowded camps to breaking point. She was just five when her family fled persecution of the Muslim minority in Myanmar and has become trapped in the poverty of the refugee camps. "My children sometimes ask me what their future will be. I don't know what to tell them," said the widowed mother of four in her dark, damp hut in Kutupalong camp near the Myanmar border. "There is no happiness here," she said. "If we had a decent house and enough to eat it would be wonderful. But we live in a camp, there is not enough to eat, so really there is no happiness here." The influx of about 520,000 Rohingya in the past six weeks has made the situation even worse, overturning the environment and human eco-system in Kutupalong, where elephants once roamed. The elephants are gone, trees and any other plant life have been razed to make way for the tidal wave of humanity that has taken over the hills around what was once a tiny village on the Bangladesh border with Myanmar. Hafez Ahmed, who sells bamboo on the roadside, arrived at Kutupalong 27 years ago. "When I came here, it was an area of green hills, uninhabited, covered with jungle. There were elephants here," he said. The nearest elephants are now dozens of kilometres (miles) away. Behind him the tented city spreads further each day from one hill to another. The Rohingya, whether they fled unrest in Rakhine state in 1978, 1991-92 or this year, do not feel wanted anywhere. Myanmar considers them migrants from Bangladesh and refuses to give them nationality -- even though many lived in Rakhine for generations. Bangladesh wants Myanmar to take back the Rohingya. It does not let the refugees work or move outside the camps. They are forced to live off UN and charity aid, waiting for a return to Rakhine that will probably never materialise. Some manage to get work as black market labourers. A small bribe to local police allows occasional trips outside the camp, said Mohammed Idriss, who has been at Kutupalong since 1992. "It is the life of a prisoner," he told AFP as he started to cry. "I have been here so long, this is not a life." 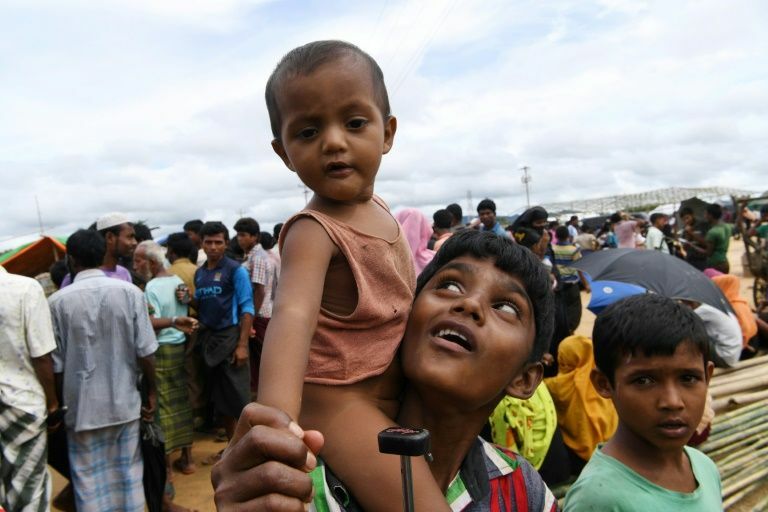 Bangladesh authorities want to extend the existing camps around Kutupalong into a refugee city for the 800,000 Rohingya that the United Nations has warned will be dangerously overcrowded. The camp already has its own archaeology which sets out the different waves of refugees. The oldest residents have huts with mud walls but successive newcomers were forced to find shelter further away from the key roads, their homes even more basic. Those who arrived since August 25 have had to live in tents pitched on monsoon-soaked mud. Few will admit any hope that they will be allowed to return to Rakhine, even if Myanmar has said it will take back refugees whose identities are "verified". "Bangladesh will send back a few, Myanmar will agree to take them, but in six months, it will all start again," predicted Kafait Ulah, who has spent all but eight of his 34 years in Kutupalong.